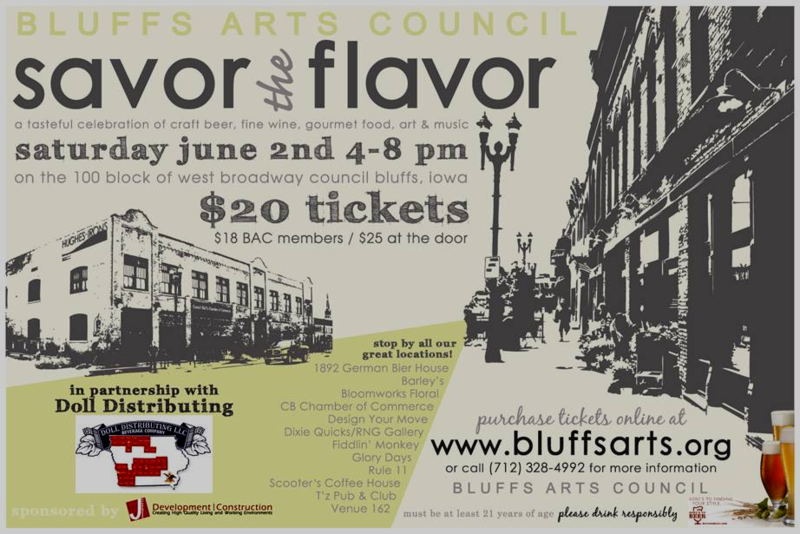 A tasteful celebration of craft beer, fine wine, gourmet food, local art and live music. For $20 in advance or $25 at the door the day of the event, you will get a commemorative glass, samples of craft beer, fine wines, and food pairings at each of the venues PLUS view live musical performances and the work of local artists. BAC Member tickets are $18. Participating locations include 1892 German Bier Haus, Barley’s, Bloomworks, CB Chamber, Design Your Move, Dixie Quicks, Fiddlin’ Monkey, Glory Days, Scooters, Rule 11, T’z, and Venue 162, and more! Must be 21 to participate; you will have to show your ID at check-in. 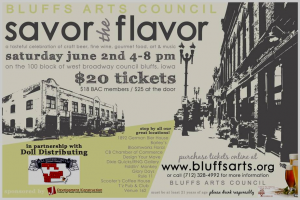 For more information or to purchase tickets, click here for the Savor the Flavor page on the Bluffs Arts Council website, or call them at 328-4992.